Since 2011, [Alkhawaja] has been living in self-imposed exile in Denmark “due to the necessity of being abroad for her work and for safety and security reasons”. AlKhawaja successfully visited Bahrain for a fortnight in January. On August 5th, she announced her plans to return to Bahrain to monitor the human rights situation in advance of the planned protests on August 14th. AlKhawaja holds dual Bahraini-Danish citizenship and was intending to travel on her Danish passport as her Bahraini passport has expired. I had the flight this morning from Copenhagen and everything was fine. I did the online check-in yesterday. I was blocked at the boarding and told to check with the counter because there was a problem. 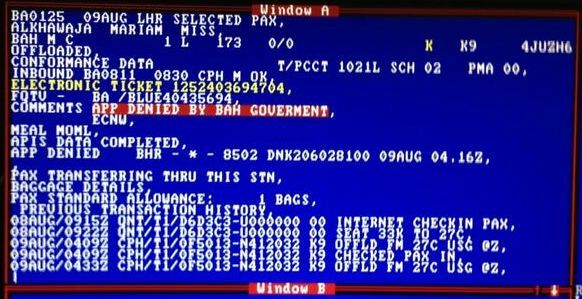 The lady called the office in London who told her that there was a denied boarding message as a decision from Bahrain government. If British Airways has agreed to a ban, they have to give you a reason for that. The lady at the counter, instead, said it was not mentioned in the system and she did not know. I’ve put in a request and they’re going to get back to me. I told them to move as fast as possible because if I don’t receive a response I’ll be consulting a lawyer on the possibility of going to court. 21. In no case may a person be arbitrarily deprived of the right to enter his or her own country. The reference to the concept of arbitrariness in this context is intended to emphasize that it applies to all State action, legislative, administrative and judicial; it guarantees that even interference provided for by law should be in accordance with the provisions, aims and objectives of the Covenant and should be, in any event, reasonable in the particular circumstances. The Committee considers that there are few, if any, circumstances in which deprivation of the right to enter one’s own country could be reasonable. A State party must not, by stripping a person of nationality or by expelling an individual to a third country, arbitrarily prevent this person from returning to his or her own country. Several NGOs voiced their concern at the decision, including Human Rights Watch, Human Rights First and POMED.